Eastern Red Cedar- Grows to 10-50 feet on average. Is actually a juniper species not cedar and produces juniper berries. Drought tolerant. 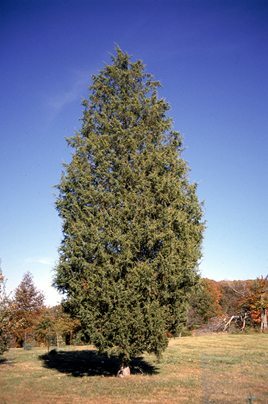 Virginia Pine – Grows up to 70 feet. Grows rapidly. Highly drought tolerant. Locust Tree – Grows to 30-50 feet. Thorny. Ideal for streamside and wild – not landscaped – settings. Shumard Oak – Grows up to 60-110 feet. Moderate growth. Drought tolerant. American Plum (Wild Plum) – Grows to 35 feet. Understory tree. Requires moist soil conditions. All parts of this tree, except the plums, contain the toxin hydrocyanic acid. 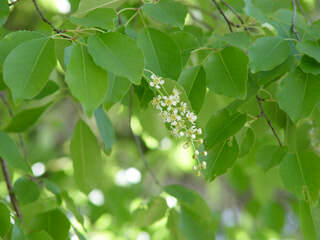 Serviceberry – Grows to 15-25 feet. Full sun or partial shade. Soil should be rich, moist and well drained. Ideal along edge of woods, streams, ponds. 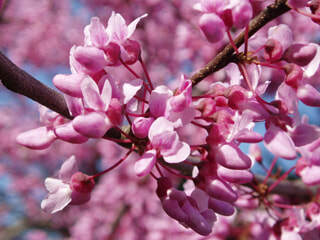 Redbud – Grows to 15-30 feet. Full Sun or light shade. Medium growth rate. Moist, fertile, well-drained soils. 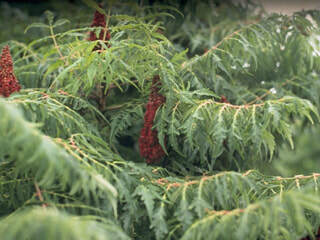 Staghorn Sumac – Grows to 15-30 feet. Grows rapidly. Drought tolerant. Black Cherry - Grows to 25-110 feet. Fast growing. Edible fruit, but the rest of the plant contains amygdalin and can be toxic if consumed. 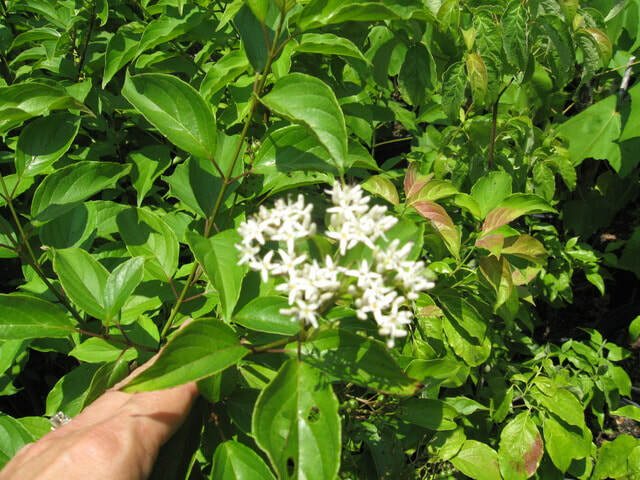 Silky Dogwood – Grows to 6-10 feet. NOT drought tolerant. Intermediate shade tolerance. Moderate growth rate. 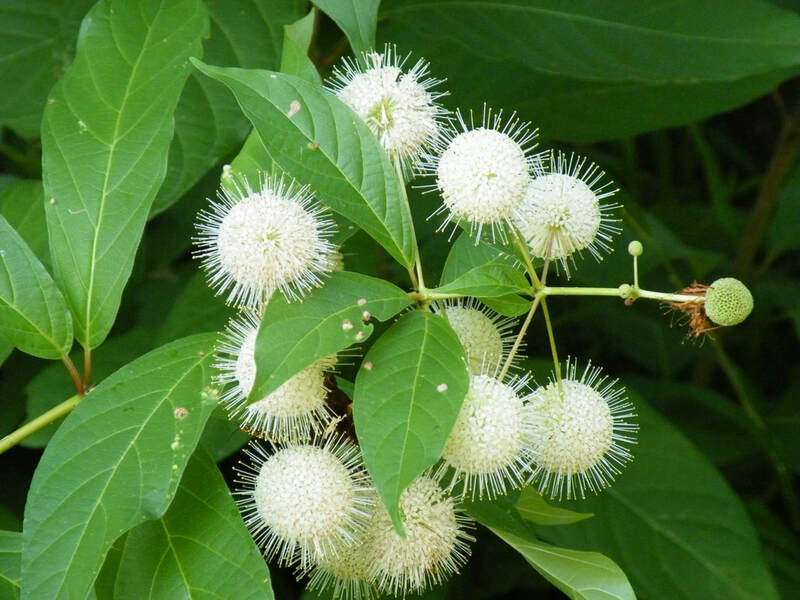 Buttonbush – Grows to 5-12 feet. Full sun to partial shade. Grows in moist conditions – not drought tolerant. Flowers attract bees and butterflies. Buckbrush (Coralberry or Indian Currant) - This is a shrub, not a tree. Grows 2-5 feet tall and 4-8 feet wide. Full sun to part shade. Drough tolerant. Berries are emergency foodsource for wildlife.